There is beach access here as well. This beach has shells, but swimming is not recommended due to causeway currents. Since it’s so easy to reach, the Sanibel Lighthouse beach can get crowded. The beach mile markers begin at mile 0 near the north end of the lighthouse parking lot. From 7AM until 7PM, you’ll need to pay $2 per hour to park in the lot. 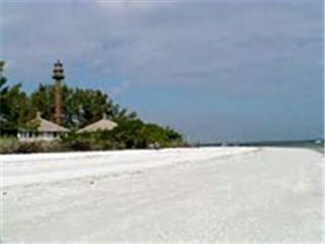 The Sanibel Lighthouse is at the eastern end of Periwinkle Way (and the eastern tip of the island) – just follow Periwinkle to its end, and you’ll be in the parking lot for the lighthouse.